I'll give it to you straight: this game is 110% better than the first. At least, that's what I think. The reason for this is equally plain and simple: melee weapons. Since you're not simply limited to the pistol any more, you can actually fend off the hordes of zombies that surround you. I always keep one handy incase things get messy. When I get barfed on, I pull out the melee weapon. When that car alarm goes off, melee weapon. When you're overwhelmed with zombies during the finale of the stage, melee weapon. Despite the game being harder, the inclusion of melee weapons actually makes it easier and more fun to play. But, damn, is this game tough! It took many, many a death and countless hours over several week of play with a friend to get to the end. And that was on normal. Not only is this game 110% better, it's also 110% more brutal. The game will literally throw four witches at you. There's often multiple special infected at once in addition to overwhelming amounts of plain vanilla zombies. Thank goodness for those melee weapons! Besides that, the game plays more or less the same. It does, however, have a metric ton of new stuff thrown in there. There's realism mode (as if the hardest difficulty wasn't hard enough) in which headshots do extra damage and there are no health packs meaning you must revive your pals with a defibrillator. There's new special infected such as the spitter, who spits acid, the jockey, who literally rides you around, and the charger, who charges you and pummels you to death. There's new guns, but they really aren't all that different from the old ones, save for a powerful new rifle and grenade launcher. The environments are all new and range from swamps to carnivals (zombie clowns!) to office buildings. Some levels even take place in the day now, a welcomed change of pace. The music is less annoying, better, and better integrated into the experience. The characters are quite a bit more interesting in my opinion. While I quite liked Bill, I found him very one diminutional. Zoey had no personality, and Francis was freaking annoying. And I only liked Louis because of the way he screamed "REALOADIN'!" The survivors in L4D2 (Starting to sound like Star Wars robots, isn't it?) are far more interesting. They all seem to have their own roles in the group, as well as well developed personalities and backstories. Trust me, you'll love the characters. The one gripe I have is the repetitive gameplay. The first game had this as well, but if feels a little more apparent here. That's mostly because every "movie," though longer, has a lot of repeated formulae. Many, many times you'll be asked to turn on an alarm to progress which attacks the horde. You'll then have to get where you're going and shut it off again. It sounds fun the first time, but after doing it 5+ times, it's just not. Besides that, the levels are actually more different from each other than they were in the original. That's good. It keeps things from getting stale. Overall, I really recommend this game. It's one of my go-to games to play with friends. If you enjoyed the first, this purchase is a no-brainer. If you weren't a fan of the first like me, give it a try and you might just change your mind. 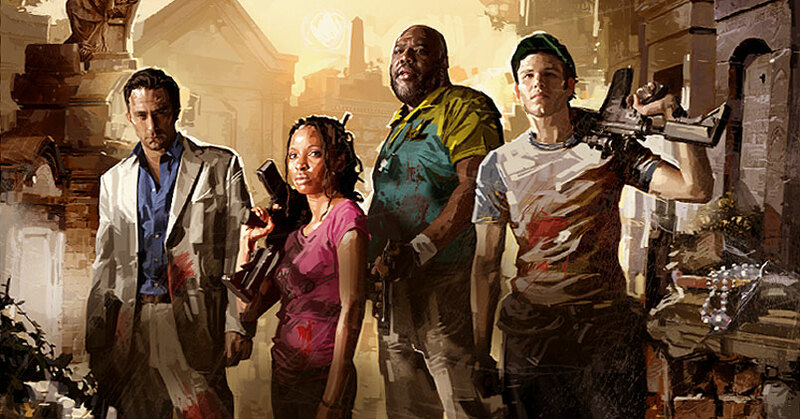 On a related note, if you miss the original cast, some new DLC for L4D2 (sounds like I'm talking in code now) just released today. It adds and extra stage to the game called "The Passing" in which the cast fromt he second game meets the cast from the first game. Oh, and one of the original four survivors dies. Thanks Stephen! Many good times playing LFD so thanks for the review. I heard something about how people were complaining that this game should have been an add on to the first one instead of a new game. I mean, come on, it is simply an improved version of the last game. What do you think about this? Should games like this be updates or new games?